A model walks the runway at the Rag & Bone Women's Collection Fall 2011 fashion show during Mercedes-Benz Fashion Week. 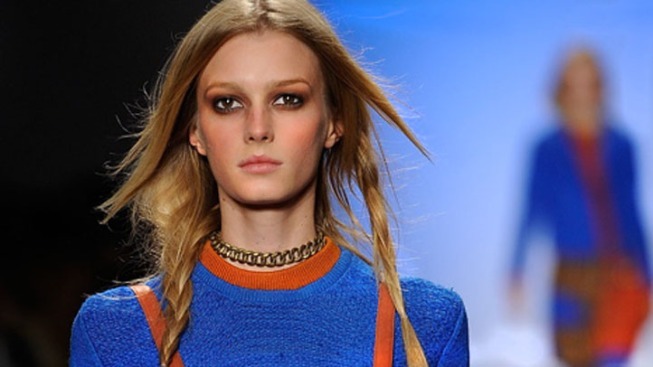 With New York Fashion Week just around the corner, intel is starting to trickle in about the Spring 2012 show season. Designers that haven’t shown in years are coming out of hibernation, mass brands are hosting presentations in droves and a plethora of up-and-comers are making the upgrade this season from presentations to full blown runway shows. Fashion week’s bloated calendar this season suggests that a diverse range of brands increasingly value the press and buzz associated with the week. This growth is likely a welcome sign for the New York fashion community on the 10th anniversary of 9/11, when fashion week was canceled and the fashion week tents were turned into temporary missing persons retrieval centers. One brand returning to the New York fashion calendar this season is Helmut Lang, which hasn’t had a runway show since 2007, and will be showing this season at Hudson River Park’s Pier 57 under the direction of husband and wife Creative Directors Nicole and Michael Colovos. The label is owned by Link Theory Holdings, which is hosting another high profile show this season -- Theyskens’ Theory. Celebrity stylist Rachel Zoe, while certainly not a newcomer to the front rows of fashion week, is staging a presentation for her namesake collection for the first time this season at a space in midtown. No word on whether baby Skyler will make an appearance. Similarly, Yigal Azrouel is presenting his lower priced diffusion line Cut25 for the first time, which launched in the fall of 2010, at Highline Stages. This presentation will be in addition to two separate shows Azrouel is hosting for his men's and women's collections – it’s going to be one busy week for this designer. The big buzz this season actually surrounds all of the mass brands on the schedule. J.Crew is staging its first New York Fashion Week presentation at Lincoln Center (the brand has traditionally had a presentation of their latest collection a month following fashion week). Insiders say the company, which is aggressively eying international growth, is intent on catching the attention of international editors in town during the week. Nine West and QVC are two other mass brands on the schedule. A bevy of designers are also making the move from showing their collections via presentations (where models stand still and guests circulate around them) to runway shows -- among them Marchesa, Suno and Timo Weiland. Alan Eckstein, co-designer for Timo Weiland, told us, “The runway gives us a chance to showcase our designs with more energy and more focus on the clothes themselves.” Runway shows tend to be more costly than presentations, and this move indicates this label has had an increase in store orders.